We dressed Jordan up as an insect catcher. She wore "nature lovers" clothes, a butterfly net, hiking boots etc. We made pipe cleaner insects and sewed them on her clothing. Then we took a shoe box, cut out the back of it and cut holes in the pocket of her sweatshirt. Her hands came out of the sweatshirt into the box. (We filled the arms of her sweatshirt with stuffing and sewed on gloves as artificial hands holding the box. Through the gloves we threaded a cloth strap that held the box in place and tied it behind her neck). We put warning notices all over the box…"Do Not Open- Tarantula!" "Danger- Poisonous spider!" The best part of the costume is that we dressed her hands up as a tarantula! 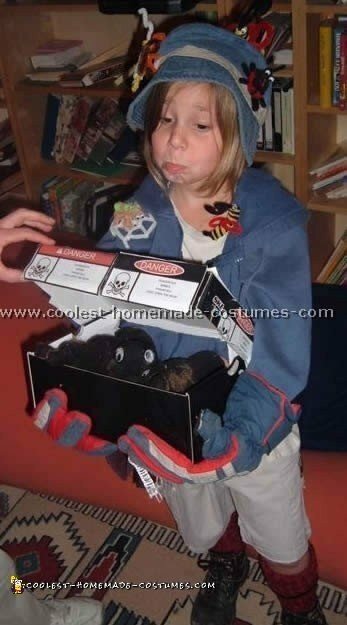 We took an old pair of black gloves, glued brown "hair" on them and sewed on a head and eyes. When she moved her fingers the tarantula crawled!